Think pork and sweet caramel don’t go together? Think again! This is my version of a classic Vietnamese dish which balances hot, sweet and savoury flavours for a well rounded meal. I have also used the base of the recipe with pan fried trout fillets which also works well if you prefer fish. Chicken and beef can be substituted and will be just as delicious. Pork shoulder can also be used but tenderloin remains more succulent when cooked over a high heat. 1. To start, grab make sure all your ingredients are prepped and weighed out as once you get going this recipe is quick so don’t be caught out! Boil a kettle ready for the rice and heat a griddle pan over a medium heat in preparation for the greens if using. Heat 1 tbsp of oil in a wok over a high heat and cook the pork pieces until browned all over and then remove with a slotted spoon and set aside. 2. If you are serving with rice and Chinese greens then pop the rice in and cook for around 10 minutes. I like to leave mine a little longer to make a sticky jasmine rice and then stir 2 chopped spring onions through it. The greens will need to be wilted in a griddle (or wok) with a drizzle of sesame oil so everything is ready together. 3. Heat the remaining oil and fry the chilli, shallot, garlic and ginger for a couple of minutes until beginning to soften. Next, pop in the sugar, water and fish sauce and stir until all the sugar has dissolved. Keep the mixture bubbling and add the pork back in the wok. This will take around 8- 10 minutes (depending on size of pieces) and the caramel will coat the pork to give a dark, sticky, glossy glaze. 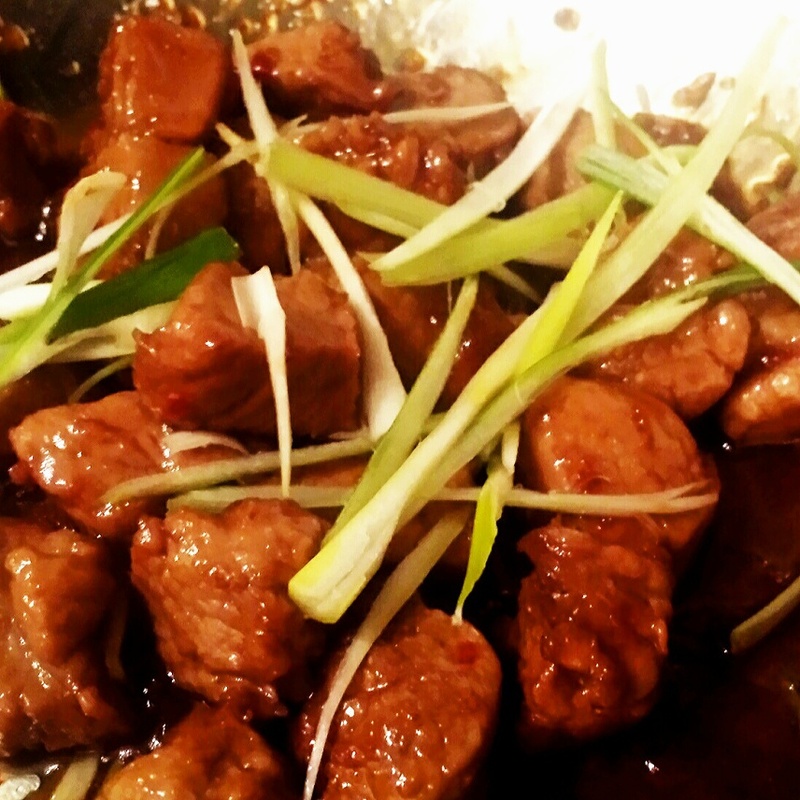 When ready, sprinkle the thin slices of spring onion over the pork. Serve in heated bowls along with the rice and greens. 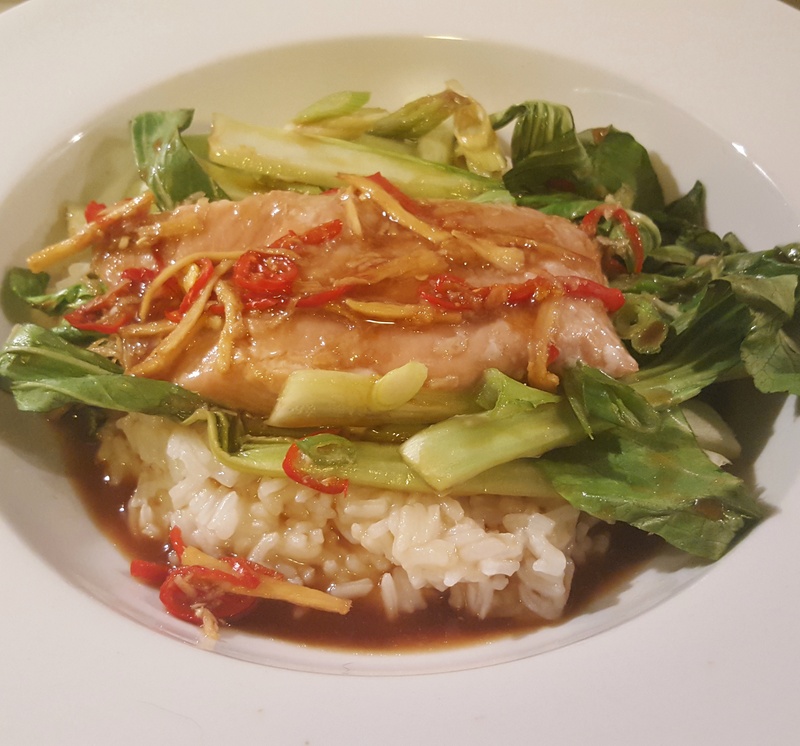 Vietnamese style caramel pork- a midweek winner!